A BREXIT has been welcomed by some of the top names in the military. 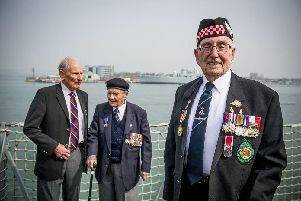 The President of the HMS Illustrious Association, Vice Admiral Bob Cooling, said: ‘I am delighted. ‘Speaking as a former military person, sovereignty is important and the ability to determine our future is important. He said he believed that being part of the European Union had hindered decision making as it took too long for all the countries to agree. He said that Nato would continue and that its protection was enough to ensure the country was supported and defended. Mr Cooling said: ‘The European Union as a military force is a complete duplication of what Nato is already providing. Rear Admiral Roger Lane-Nott agreed, saying the Brexit vote will benefit the country in the long run. Mr Lane-Nott spent 32 years in the Royal Navy, and says the EU hasn’t done enough to convince people to stay. He said: ‘In the past, the major European disasters have been dealt with by Nato with the support of America.